Andy grew up spending his weekends on Lake Tippecanoe in northern Indiana. He and his brother still talk about their first row boat “The Frank F. Golden” and the freedom of graduating to that 3.5hp Elgin outboard motor! Lake living has always been in his blood. Consistently named one of the IBJ’s top 10 agents, Andy brings invaluable real estate experience to each and every transaction. He is knowledgeable, experienced and with over $32 million in sales in 2018 alone, is one of the top selling agents in central Indiana. Partnering his real estate knowledge and passion for lake living, Andy specializes his business on and around Morse Lake. He is an invaluable resource for buying or selling a lake home and is often heard discussing various types of boats, lift capacity, reservoir water depth, seawalls, dock systems & idle zones! Andy works directly with each and every one of his clients during the buying and selling process. He prides himself in good communication and is available for a phone call 7 days a week. Completing the Sold By Sheets Team is Andy’s wife, Amanda. Amanda manages marketing, social media networking and administrative duties, which allows Andy to focus solely on his clients! He lives on Morse, He plays on Morse and He specializes his business here on Morse Lake! Andy enjoys wake surfing, competitive barefoot skiing, following the Hoosiers, being present in the lives of his two teenagers (Luke & Ellie) and soaking up every moment of living on Morse Lake in Noblesville. 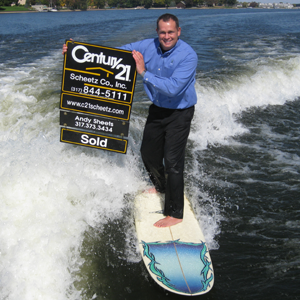 Andy is proud to be with one of the largest and top selling brokers in central Indiana, Century 21 Scheetz.